The viaduct, in addition to being Seattle's transportation backbone, has been a shelter of last resort to generations of homeless people. Its closure on Friday raises uncertainty and some anxiety for campers and for homelessness-services providers. Sunny Ray hitched a ride from Portland to Seattle three years ago, landing at the Space Needle and then making his way underneath the Alaskan Way Viaduct. He settled into a homeless camp across from the Seattle Aquarium on a large square of concrete known as The Slab. Ray spent many nights in that spot, underneath the rumbling of vehicles above, a hypnotic sound that he said didn’t stop until 3 a.m. But he liked the noise. “Knowing the cars up here are going somewhere, (there’s) some kind of weird comfort in the constant movement,” he said. Then, a few weeks ago, Ray found out the viaduct was to be closed and torn down. The rumble was coming to an end. The viaduct’s closure on Friday isn’t just a congestion headache for drivers that traveled on the road above. For decades, the viaduct provided shelter to homeless people below, who lived underneath decks of asphalt and steel that ribboned along the Puget Sound. Just as the viaduct was deemed unsafe by an earthquake in 2001, life underneath it also came with dangers: an encampment fire at least once forced its partial closure; one homeless man was fatally stabbed under the viaduct in 1999. But it also provided cover from the elements and proximity to many homeless services and organizations. Homeless people camped underneath for generations. UGM employees last week counted at least 38 people living under the viaduct, but the number of homeless campers under the viaduct has decreased since last spring. 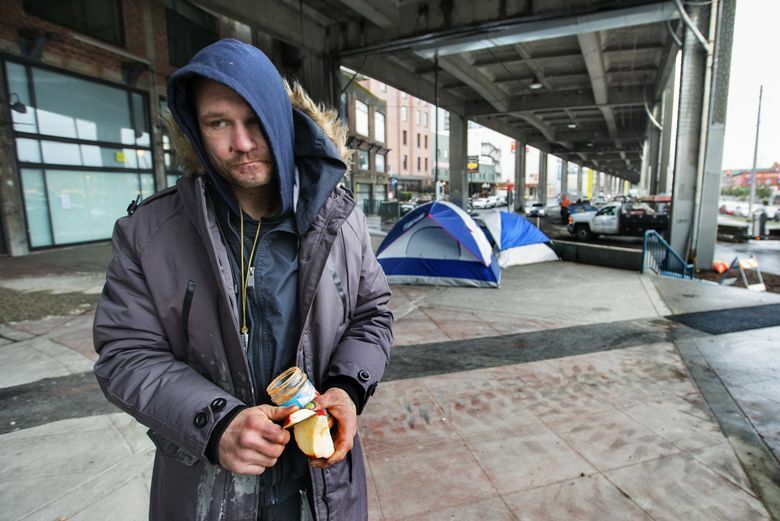 Ahead of the closure, the city of Seattle started more consistently clearing encampments, enforcing rules that allow immediate removal of camps considered obstructions or hazards, said Will Lemke, spokesman for Seattle’s Navigation Team. Those hazards were of particular concern along the waterfront level of the viaduct because so many pedestrians walk there. Often, larger tent camps blocked the sidewalks and wheelchair ramps. The Navigation Team will continue to visit any campers still living along the waterfront to ensure they are out of harm’s way before demolition actually begins, he said. “Given that it’s going to be such a hazardous and active work area, we need to make sure the area remains clear,” Lemke said. The viaduct closure will also prove complicated for the people and organizations who serve those experiencing homelessness. Compass Housing Alliance, one of Seattle’s biggest homeless service providers, butts right up against the viaduct just south of the Coleman Dock ferry terminal. The agency’s fortunes have long been tied to the structure, which was built in 1953, 11 years after Compass opened in its current location. The 2001 earthquake that weakened the viaduct also caused major damage to the Compass building, forcing Seattle to red-tag the facility. Compass set up trailers underneath the viaduct to continue providing services until a new building was ready. “We’ve seen it go up and we’ll be here when it goes down,” said Compass CEO Janet Pope, whose office looks out directly onto the viaduct’s top deck. In addition to all the services Compass operates — banking, mail and food services — they also operate three floors of transitional housing for men, many of them veterans and disabled. Employees are concerned about how the noise from the anticipated six-month demolition will affect them, particularly because work will go until about 10 p.m.
All of Compass’ clients will be limited to a single entrance in and out of the facility throughout the viaduct demolition. The Washington State Department of Transportation has already built a special ramp in and out of the building. There are other unknowns. King County’s annual one-night count of homelessness is scheduled for Jan. 25, and Compass is the headquarters for the hundreds of volunteers who conduct the count. Operation Sack Lunch provides homeless people 3,000 meals daily, with more than half prepared in the Compass building, said Executive Director Beverly Graham. Because their normal exit from the site will be closed, they are devising a temporary system to get the meals out, renting carts to haul the food up to another street, where they will park their delivery vans. “It is going to be a little bit of a puzzle,” Graham said. Despite the headaches, service providers also see this as an opportunity to convince homeless people now is the time to take up an offer of shelter. Ray had previously been in a shelter and said he’d actually consider going into again, if he were to encounter the Navigation Team now. He’s tired. He’d like to get an ID and a job maybe. He’d like to know where he can be guaranteed cover from the rain. Then again, he said, he and his friends are used to change.